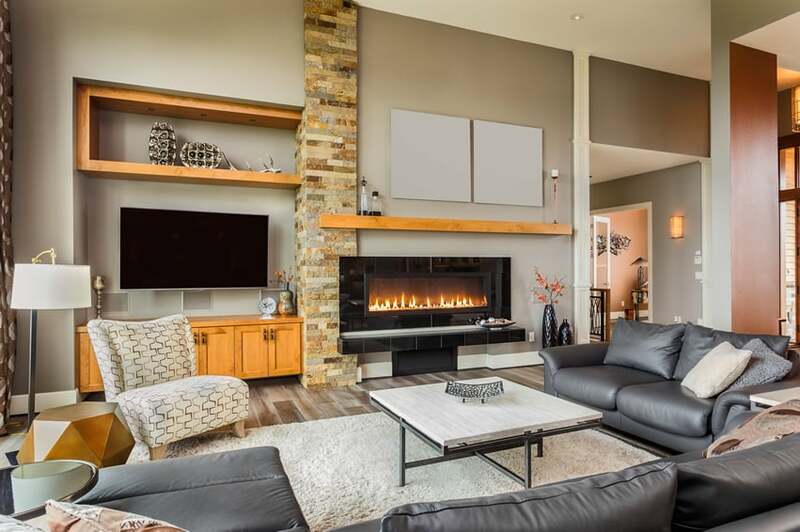 This gallery offers beautiful living room decorating ideas to inspire and help you create your own stunning interior designs. 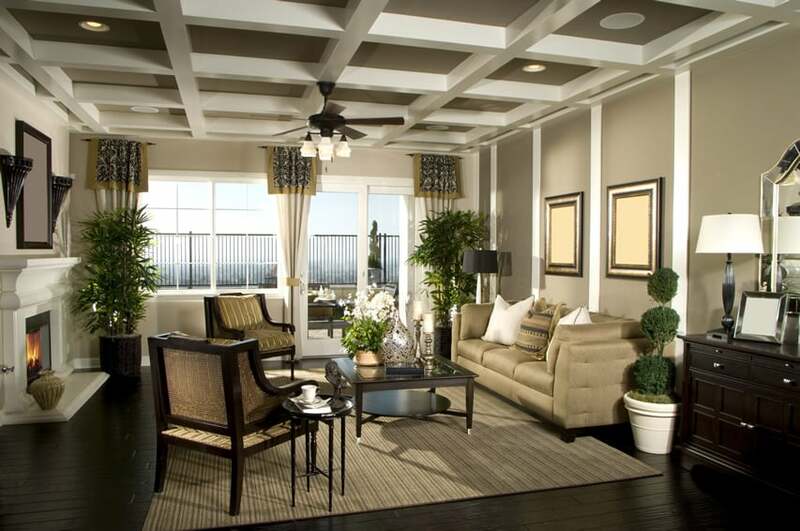 Your living room is a place for conversations with friends and family. Use it to mix and match colors, create bold combinations, add interesting pieces, textures, and layer rugs to add depth and dimension. Mix and match materials – A lot of depth can be brought to a room by experimenting with different materials, finishes, and textures. Patterns are often used in rugs to add visual interest to a room. When mixing different colors try sticking to a simple color palette to create a relaxing atmosphere. Add a collection – Introducing some eye catching decor that is all part of a similar theme can tie the room together and add cohesion. Bring in something bold – A neutral color room can be brightened by adding a bold & bright piece to add some needed contrast. Use mirrors to enlarge smaller spaces – Smaller rooms can definitely give the illusion of additional square footage using this helpful trick. This beautiful living room has an Asian contemporary theme, using modern forms and combining it with darker wooden elements. 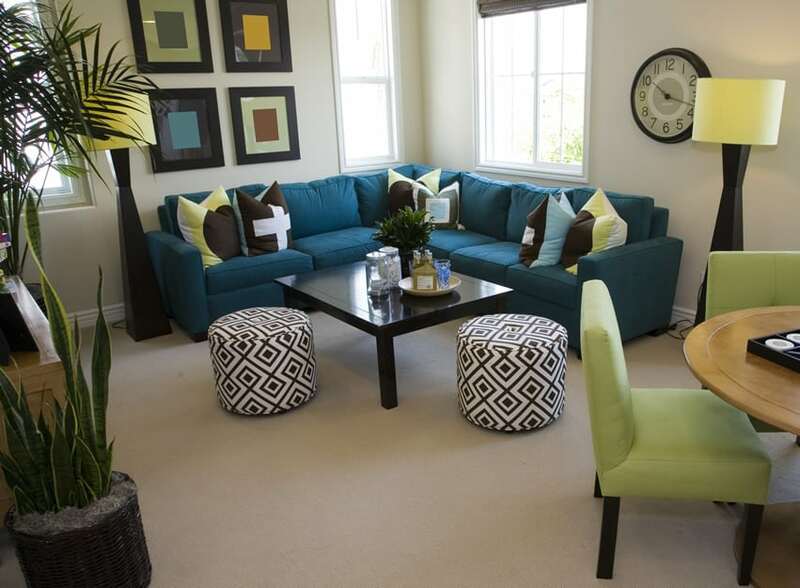 As in this example, this room uses blue-green and a lime green color, making for a fun and fresh color scheme. The plain walls and flooring gives you freedom to use bolder colors and patterns, and therefore, you will see geometric patterns on the ottomans, the throw pillows and the simple framed artworks as seen on the wall. With a modern resort-style theme, this living room has a color palette that has a universal appeal. The room itself is simple and elegant, with a large picture window letting in natural light into the living room and providing a view to the garden’s water feature. Furniture forms are simple and boxy, playing around the textures to give it more personality. 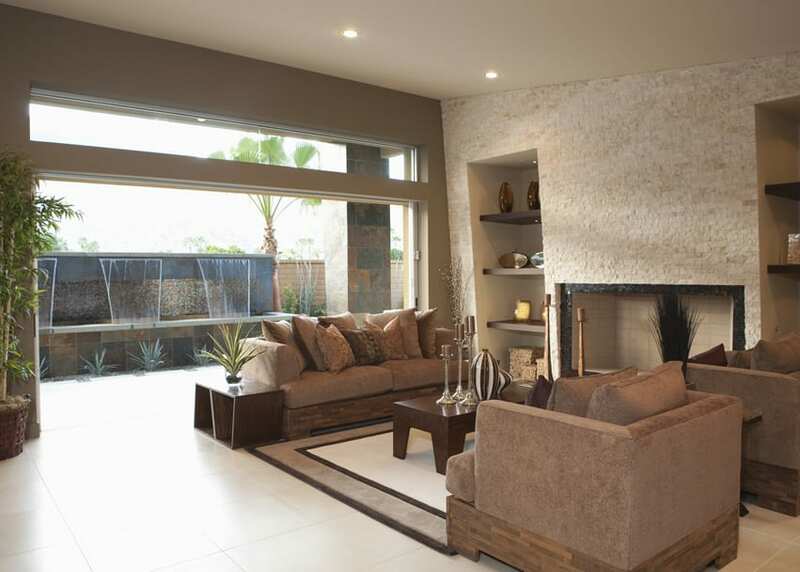 Main walls are painted in a light mocha color, with an accent wall with textured masonry tiles in off white. It uses simple accessories, such as candle holders, various vases and plants to complete the look of the room. One thing to note on this living room design is the repetition of the square shape. With dark wengue flooring, the white-painted coffered ceiling stands out against the warm gray base. Furniture pieces are a mixture of modern and classics, with a modern tufted sofa and more classic armchairs with rush backrests and matching side tables. For accessories, the room uses pan interesting animal print curtain swag, different indoor plants and candle holders to give more life to the space. 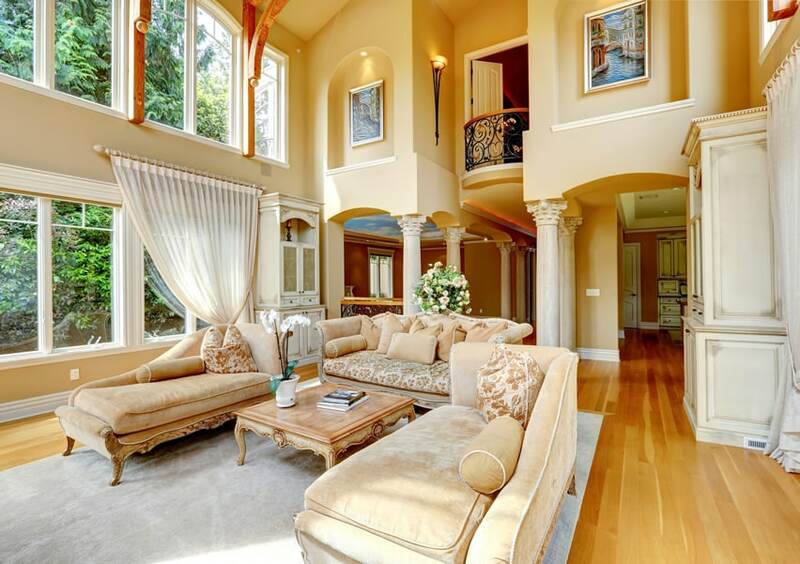 With classic European details and furniture, this living room speaks of class and elegance. The whole space is coordinated in colors and theme, using the same shade of yellow to paint all across the common areas and matching Pine floors for that yellow-orange wood tone. Furniture are typical classic styles with cabriole legs, carving details, velvet fabric and scroll arms. The faithfulness to the design theme, evident in architectural details, furniture and accessories, makes for a well-coordinated look. The boxy furniture forms and coffee toned wengue stain is a give-away for the Asian contemporary theme of the space. Opting for a very simple white and off-white color scheme, this design is very neutral and appeals to a large demographic making it excellent for rentals. Upholstery is uniformly off-white be it leather or canvass, and wooden furniture are all in dark wengue stain. There are very few accessories and some small red items to give the space a pop of color without being too overwhelming. This is a more fun take on the Asian contemporary style, opting for a more natural Walnut wood finish than the typical dark wengue stain. The furniture is still boxy in form, but are modified versions of more organic mid-century modern pieces. The color choice is also bolder, using blue, orange and dark gray which works for the very bright all-white walls and ceiling. The space is simple but well-balanced, with not too many accessories and decoration. A unique mix of classic furniture pieces with a unique floor plan and contemporary application of materials, this living room design is surely impressionable. The Living room itself has an irregular form and therefore also has an irregular furniture layout. The high ceiling balances the heavily upholstered furniture pieces, making it look more proportional to the space. Mirror is applied behind the fireplace wall to give an illusion of a bigger space, while large picture windows welcomes in natural light into the space. The most characteristic of this room would be its art-deco style wrought iron railings visible from the stairs up to the mezzanine. Black wrought iron is mixed with dark walnut handrails and steps, creating a elegant combination. For the furniture, modern pieces with white leather upholstery were used, save for wooden furniture pieces which are more Asian contemporary i form and color. The living area is emphasized from the rest of the house by using darker floor tiles to demarcate it. Large fully-upholstered furniture pieces make up most of the room with one large wooden cabinet. The space is simple and small, with French doors and windows that goes from floor to ceiling. Walls are painted in a textured finish to give it more depth, with a coffer ceiling painted in white and uses warm white lights to give a warm homey glow to the space. 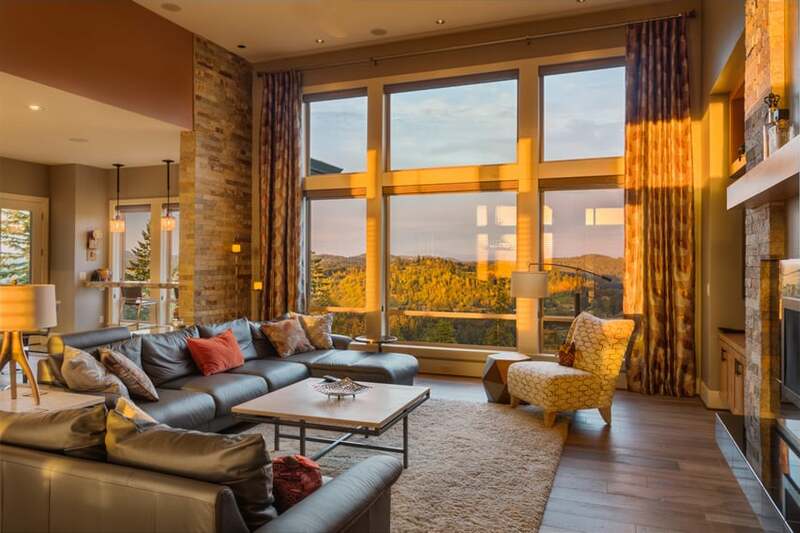 One of the best characters of modern homes is the use of large picture windows, allowing maximum unobstructed view and natural sunlight into the space. Finishes are simple and mostly neutral allowing more freedom in your furniture color selection like in this example. 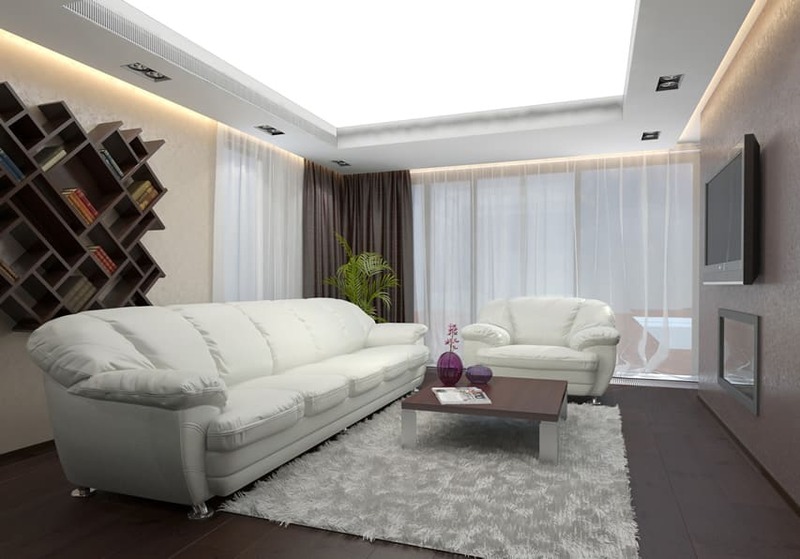 Walls, floors and ceiling are all in white, while the sofa is upholstered in a steel blue faux leather material. Stainless steel is favored over wood for furniture legs to complete the modern look. 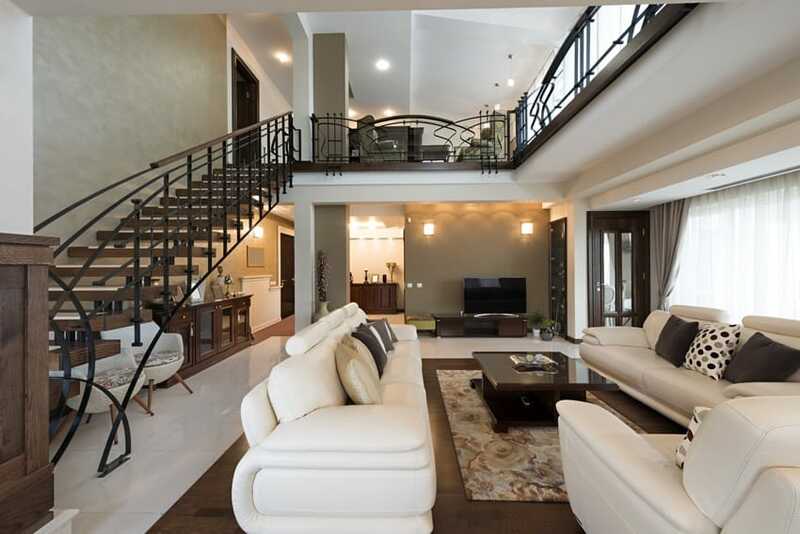 Another modern living space which also mixes in Asian contemporary furniture pieces. The is fairly small, but has a high ceiling, white walls and natural ceramic tiles for the flooring. Furniture pieces are boxy in form with dark wengue wooden legs matching the Asian-inspired coffee table and the wooden area rug. To add more color to the space, small red items area used. A very interesting Living Room concept perfect for open plan space, demarcating the living area from the rest of the house without using walls or dividers, but instead, creates a lower platform for the sofa, separating it from the rest of the floor level. Finishes are simple and clean, with off-white wallpaper and off-white ceramic tiles for the floors, creating a nice canvas to play around with. 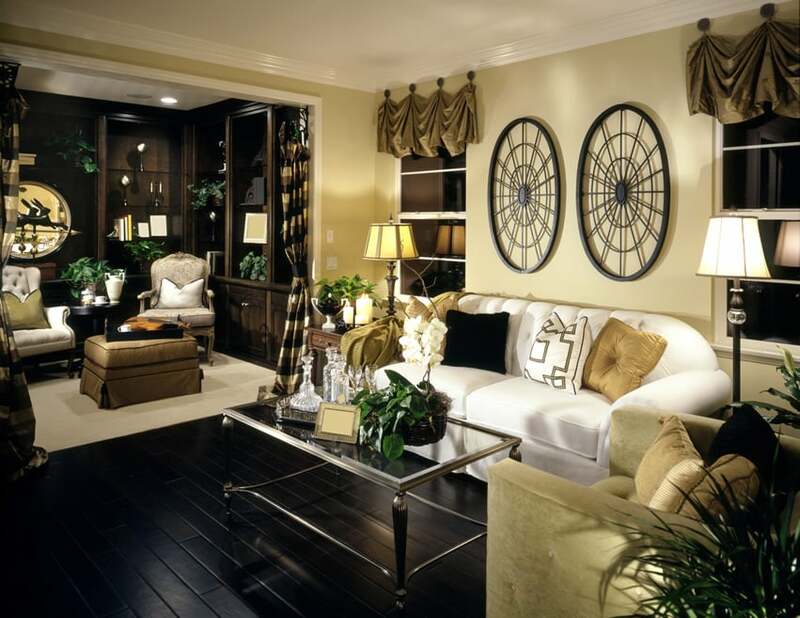 The use of browns and beige in the room automatically creates a warm and cozy atmosphere. In this example, walnut floors are combined with warm beige painted walls and masonry tiles. The large set of sofa is upholstered with leather in a dark mocha color, accessorized with throw pillows. 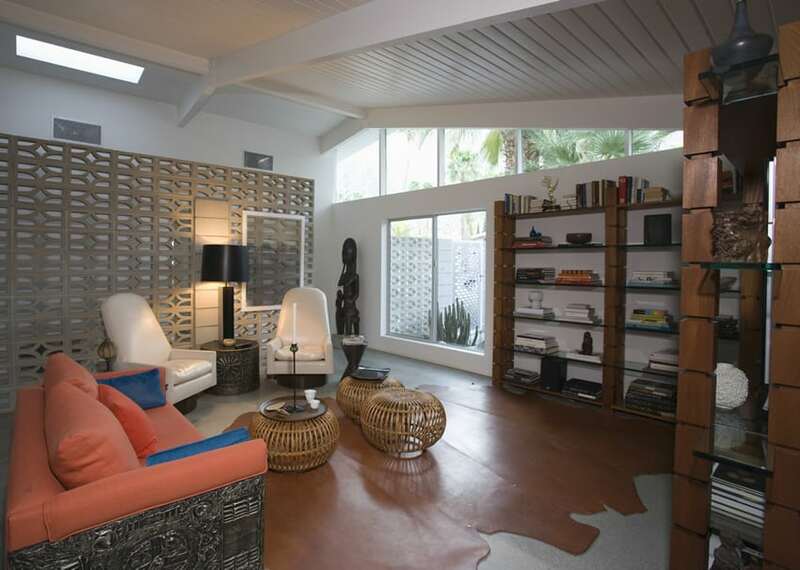 An off-white shag rug was used to balance-out the browns in the space and also to emphasize the living area. Living room decorating ideas often go outside the box to combine two or more design styles depending on the homeowners personal preference. 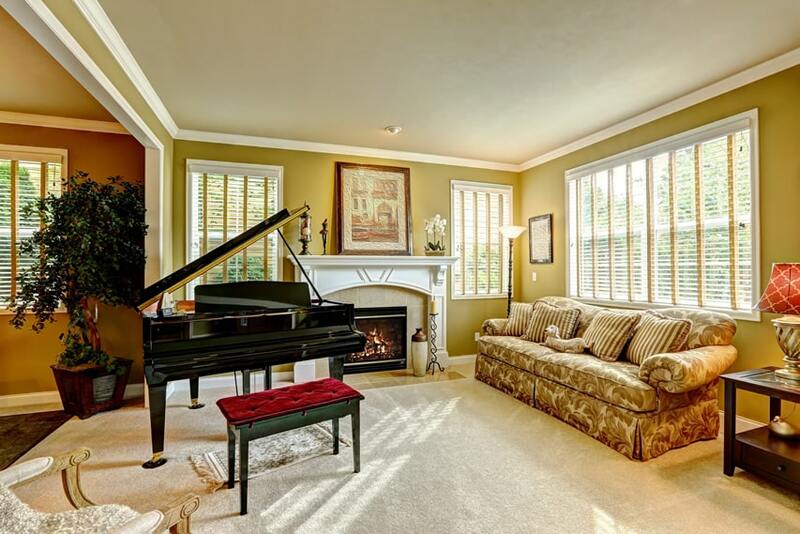 This fairly large living room is sparsely furnished with only the essential pieces. Furniture pieces are a combination of Asian contemporary and Scandinavian, using white and gray upholstery to match the over-all color scheme. A wide marble front fireplace is an impressive centerpiece for conversations with plenty of illumination from spaced recessed lighting. 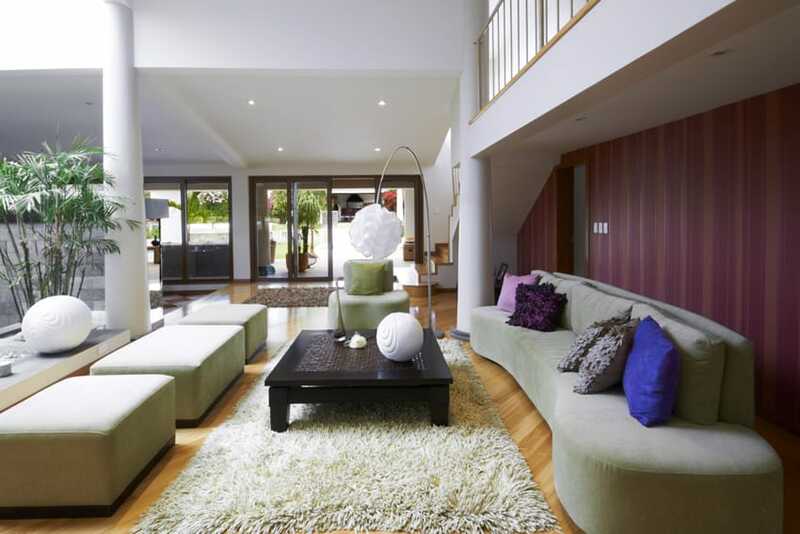 The semi-open layout of this house contributes in making a bigger and brighter looking space. The living room itself enjoys large picture windows allowing a view of the sea, coffer ceiling and comfortable carpet flooring. 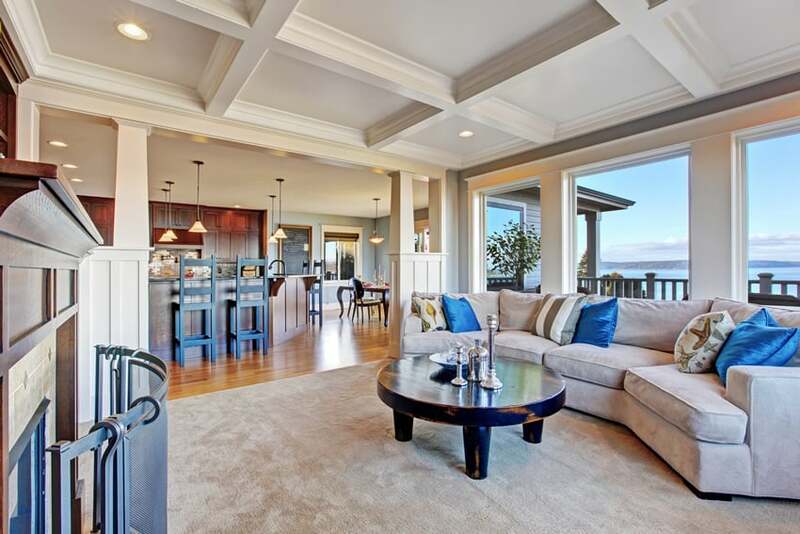 The accent pillows in blue and sea-themed prints combined with the weathered wood of the coffee table is the perfect choice for this sea-side home. Dark mahogany floor boards serve as a perfect offset for the white furniture pieces and off-white wallpaper. The accent wall has a built-in electric fireplace and a wall-mounted TV, while the back wall has a unique geometric wall shelf. This living room design does not shy away with different combinations of colors, patterns, textures and furniture styles, but still manages to form a cohesive and well put-together look. One wall of the room has 3 panels of floor to ceiling frame-less mirror, creating an illusion of a bigger space. The space itself has carpeted floors with square patterns, purple and oatmeal colored walls with matching sofa and armchairs. Various pillows with different patterns were used, along with a unique semi-circular silver console table and various indoor plants to accessorize the space. Another Asian-inspired space but more on South Asian design aesthetic. It uses a dark mustard paint for the walls combined with terracotta red and furniture pieces with a mixture of beige, olive, reds and prints. Pillow fabrics and throws also have very South Asian patterns/design, coordinating with the accessories made up of various sculptures, potteries, etc. Another modern living room design with plain off-white walls and white ceiling combined with once accent wall with a built-in modern fireplace to complete the look. 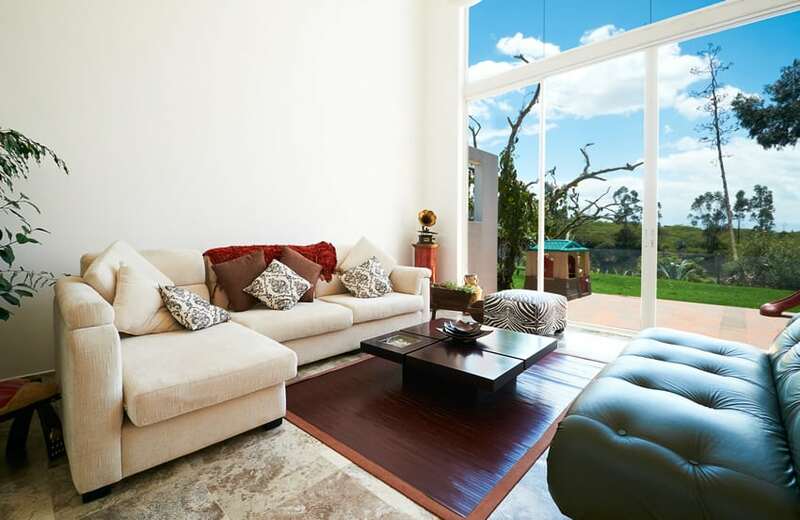 Furniture pieces used is one leather bench with a matching L-shape white leather sofa and a large square coffee table. Only a few accessories can be seen in the space, staying true to its modern aesthetics. White walls and light maple floors make up for a perfect vignette of a living room, representing the simple and clean aesthetic of Scandinavian design best. This is an example of that, and even with just a few pieces, one white sofa, an oblong coffee table, a low shelf, a few accessories, some plants and accent pillows, this living room looks perfectly well-balanced and pleasing to the eye with enough warm and cool tones to complement. With a generous amount of space and gorgeous architectural details, this beautiful living room enjoys the luxury of placing many furniture pieces and accessories. Furniture pieces are of classic styles to match the interior architecture, and have a large massing perfectly proportional to the size of the space. Two large sofas upholstered in a beige colored fabric are placed perpendicularly, as well as two armchairs. The space allows enough for 2 massive solid wood coffee tables, a round side table, a wooden console behind the sofa, and even two large cabinets placed beside the fireplace. The space is well-accessorized with plants and other decorative items. 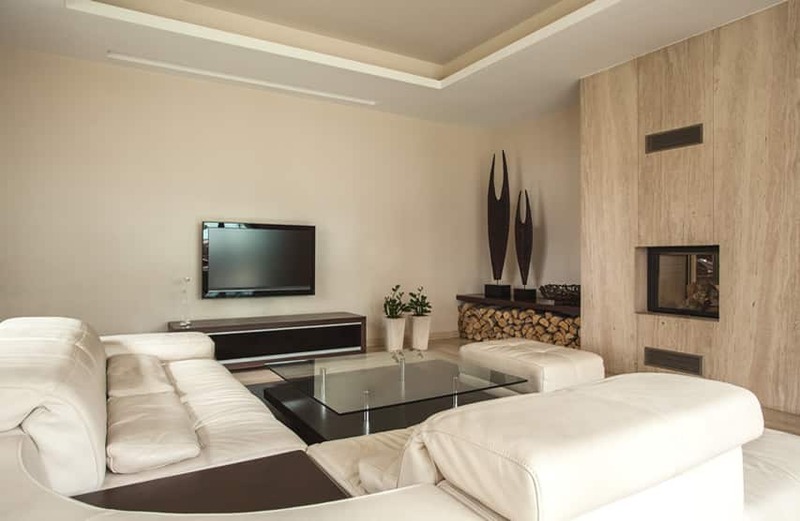 A modern living room space with a darker color palette usually typical of media rooms. Floors are black ceramic tiles, with dark gray walls to match. A large natural fiber area rug creates a lighter floor surface on which the other furniture pieces stands. There’s a large white leather upholstered sofa, a hide leather-upholstered armchair and footstool and a Japanese-style coffee table. This space is also of a transitional design style, combining traditional furniture silhouettes with modern prints and fabrics. Floors are plain white with a mustard-beige wall. There’s two sofas upholstered in white canvas and one accent chair with green leopard print upholstery. 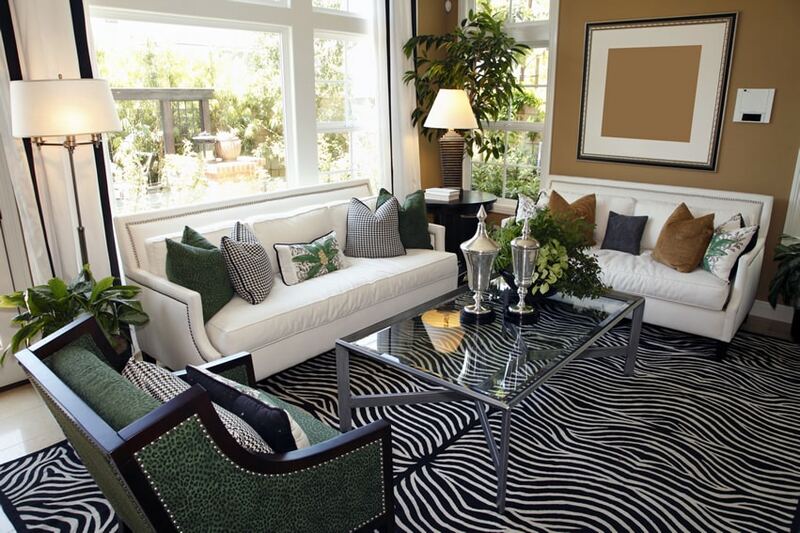 The area rug is of a bold zebra print, making a huge statement in the room. There’s also a variety of prints and colors used on the accent pillows, as well as accessories to complete the look. 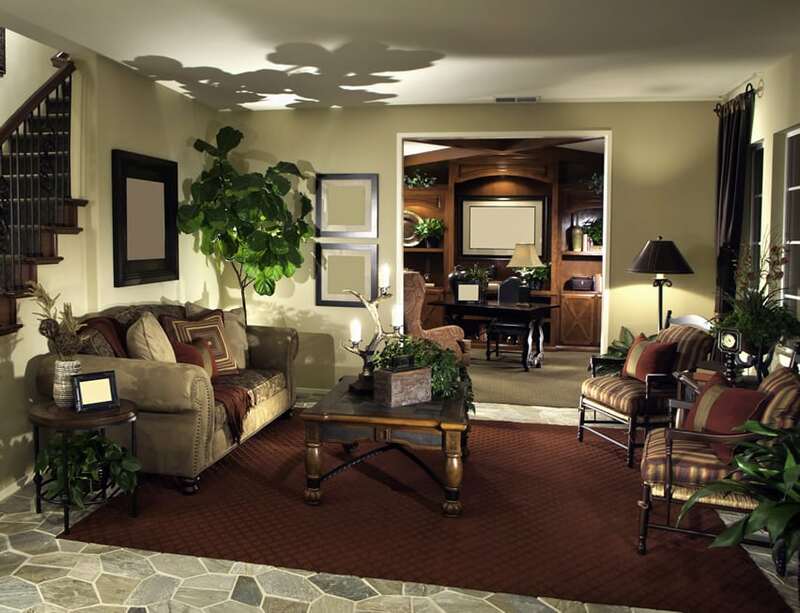 A medium-sized living room which follows a natural color palette, focusing on browns and beige with accents of green. Walls are in a light beige color, and the flooring for the living area is a beige carpet. 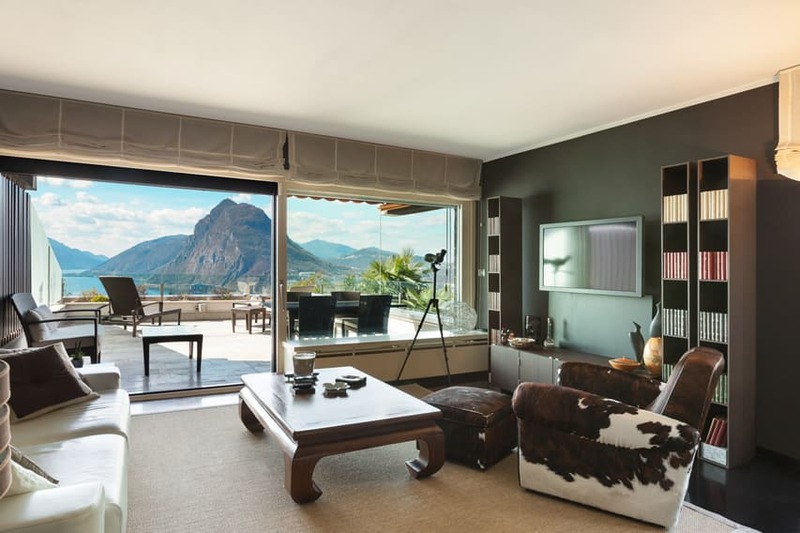 Windows are framed with light mocha-colored curtains, and even the L-shape sofa is upholstered in a beige fabric. 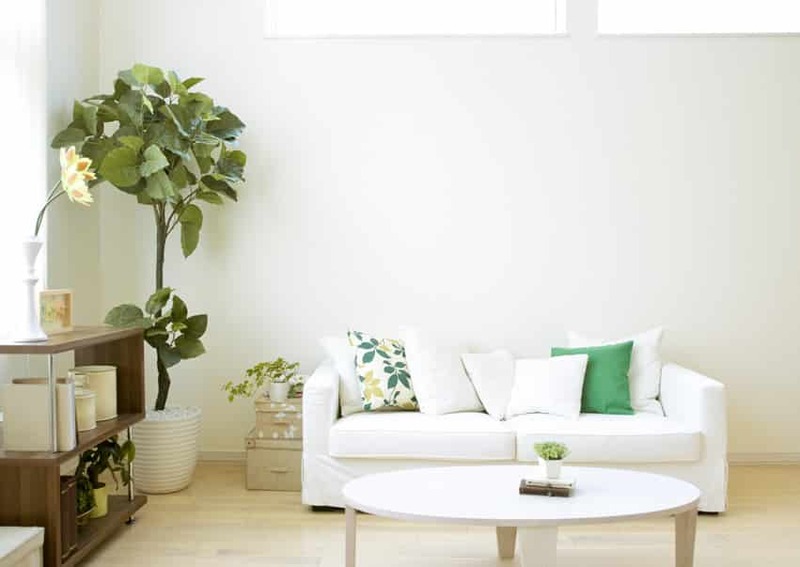 Various indoor plants were used in this design, and can be found all throughout the home, serving as a refreshing pop of color in the space aside from naturally improving the indoor air environment. The look of this living room was achieved by combining Asian design elements with modern design aesthetics. Wooden floors and oatmeal-painted walls serve as a soft and natural backdrop,while the brown and white area rug help emphasize the living area. 2 sofas were used both upholstered in a gray fabric and uses a variety of accent pillows, and there are two accent chairs with dark-stained framing which matches the coffee table and the side table. Plants also serve as ornaments, as well as various decorative objects to complete the look. The balance of beige, stone, wood and plants in a room create a sort of natural appeal to a space. Like in this particular example, various shades of browns and beiges were used on fabrics on the pillows, combined with a natural stone floor and a variety of indoor plants spread across the room. The lighting under one larger plant produces a dramatic effect, casting a shadow in the room, adding to a mysterious effect. Bright and refreshing would be an understatement to how beautifully natural light leaks into this room. One side of the wall is flanked with full-height doors and windows which extends up to the gable, illuminating even the ceiling area of the space and emphasizing the exposed wooden beams of the ceiling. 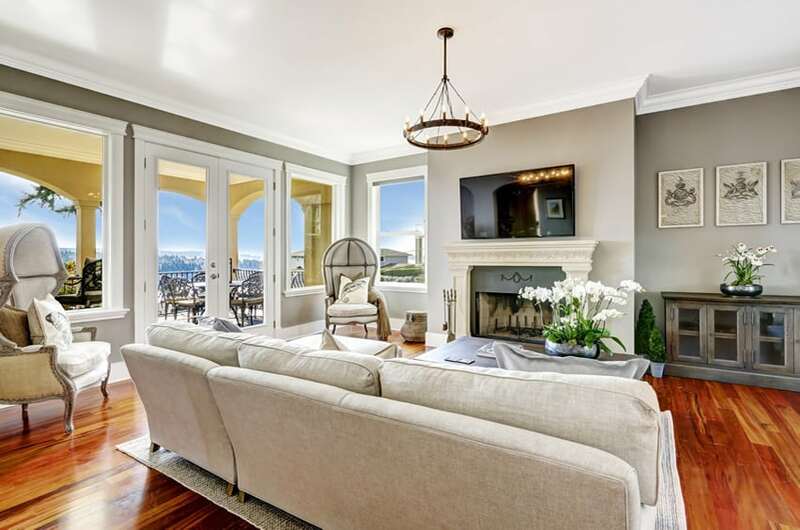 The living area itself is also a marvel, with golden oak floors polished to perfection with a set of gray sofa with two matching armchairs and one white accent chair and a pouf. 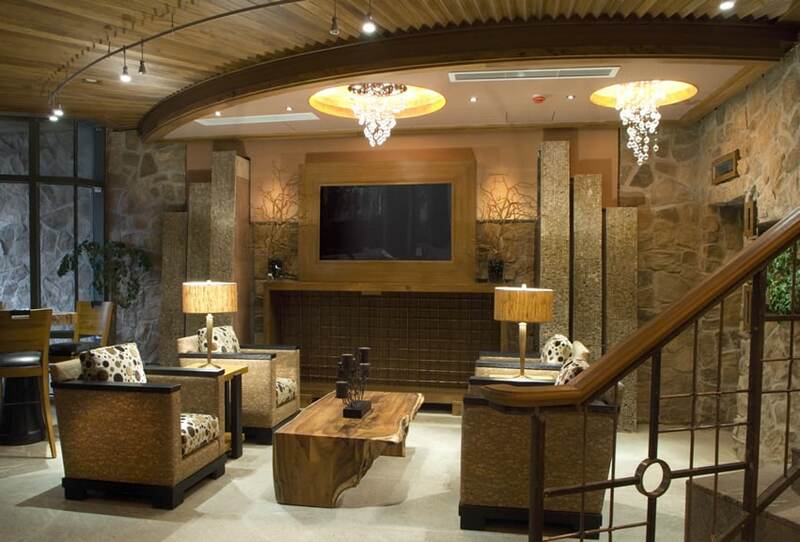 Wood, stone, metal and fabrics are harmoniously combined in this space, creating a design that is very easy on the eyes. 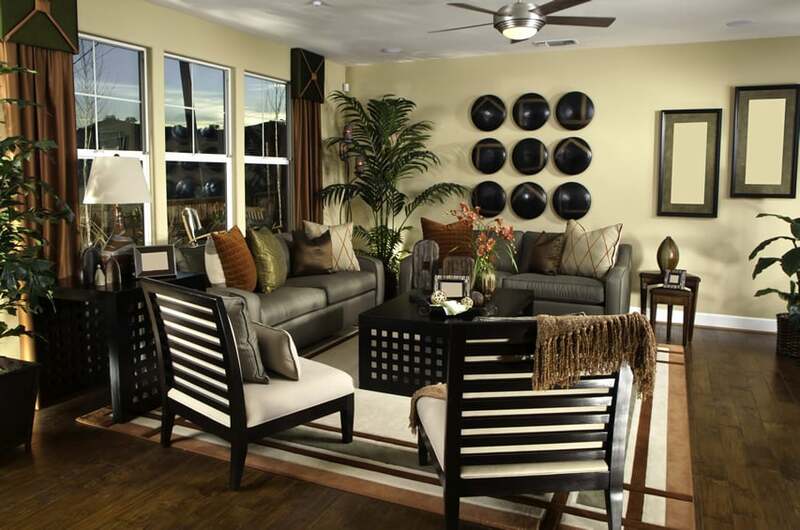 This modern living room exudes sophistication and class, with carefully-selected colors and finishes. The sofas upholstered in dark gray leather combined with a square coffee table with black metal legs give a masculine and sophisticated appeal. combined with a printed accent chair, a metal geometric stool and a white area rug, the dark gray color is balanced-off and looks softer. This living room design is very interesting with an eclectic mix of furniture style, not necessarily sticking to a particular design style. Walls are lined with shelves made of wood framing and tempered glass shelves, and on the opposite side, a pierced wooden divider painted in a light gray color can be seen. It also has and interesting choice of furniture pieces; an orange sofa with intricately carved wood framing, a pair of modern high back chairs, a hammered metal side table and 3 bent rattan coffee tables/stools. The eclecticism of the spaces is even evident in its choice of decor. 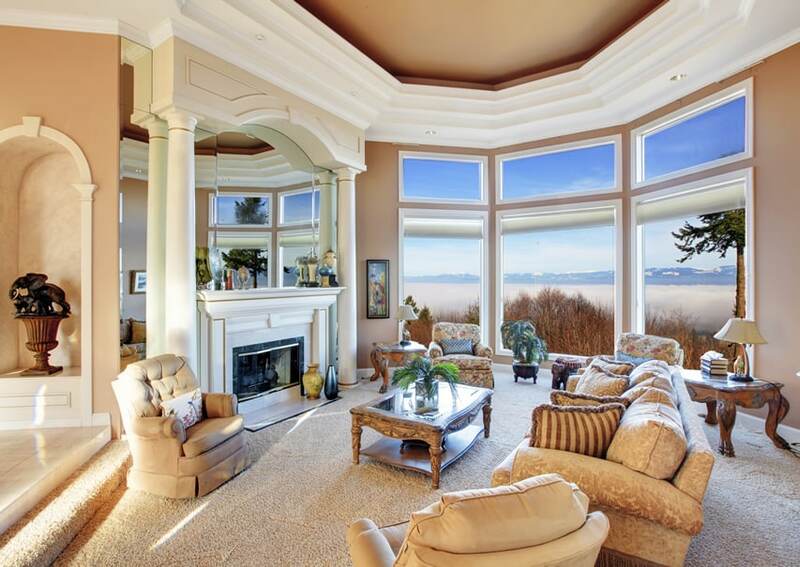 High ceiling and large windows definitely helped brighten up this living room space. Floors used also contribute to that. as it is of a beech wood color. It has an interesting modern sofa. which is long with rounded ends and upholstered in a sage green velvet fabric and accented with purple and blue pillows. The opposite side of the sofa is flanked with 3 upholstered benches with the same fabric as the sofa, and once accent chair the same style as the sofa. Right in the middle of the shag rug, is a sort of misplaced Japanese-style coffee table. The color palette choice for this space is straightforward. It’s mostly whites and dark browns with a small hint of black and gray. 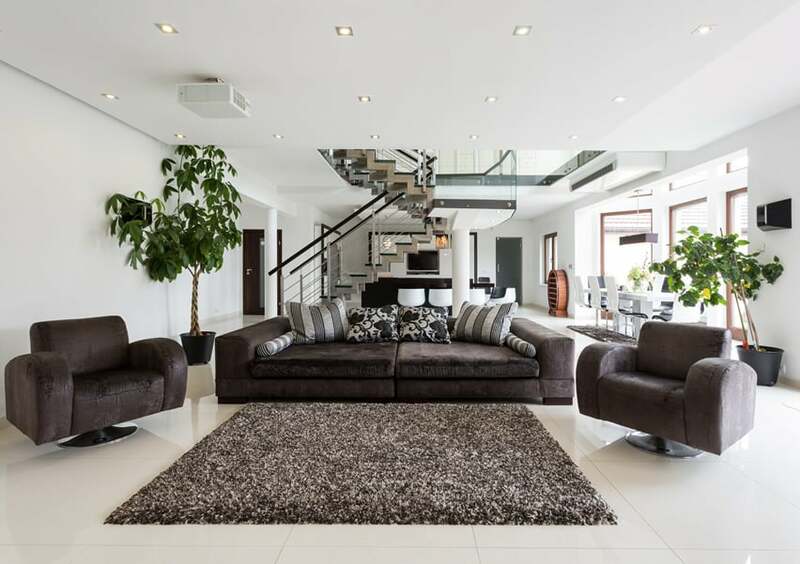 Walls and floors are all stark white, creating a bright modern space and creating a good backdrop for the matching set of sofa and armchairs upholstered in a dark brown velvet fabric and a matching high pile area rug. Indoor plants help break the monotony of the color scheme, as well as some wooden finished found on the door and window frames. 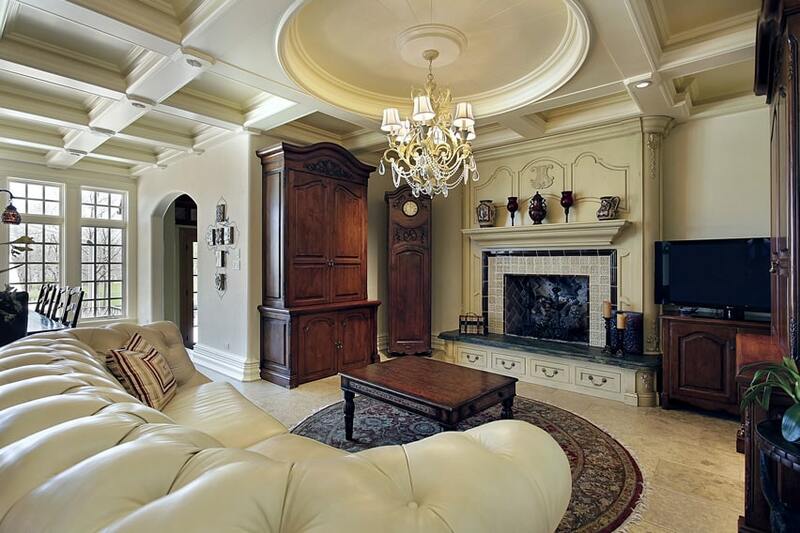 The classical architectural elements of this space is the perfect backdrop for this transitional style living room. A sofa with printed upholstery and beige accent pillows, two white wing chairs and matching solid oak coffee and side tables were used in the space. 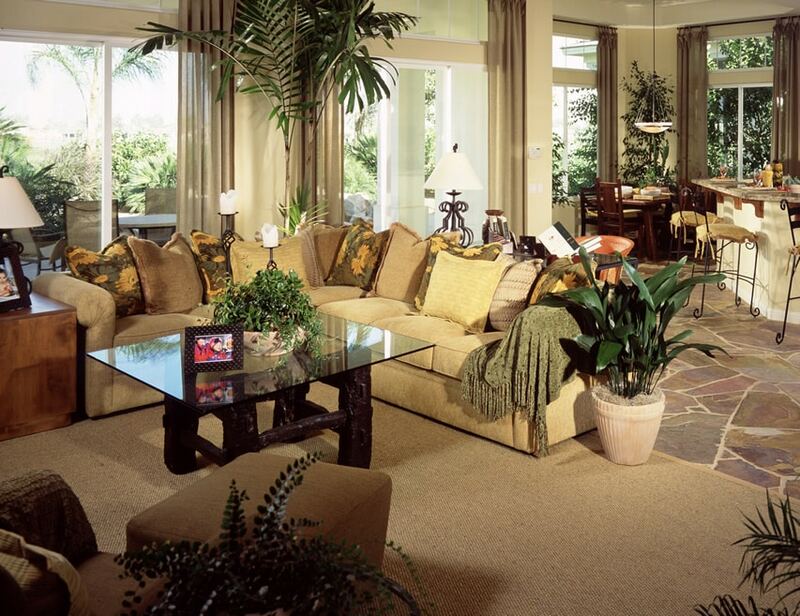 The large area rug seems to frame the living room, while the indoor plants help emphasize the height of the space. This room has obvious Asian influence with its choice of furniture and materials. The sectional sofa used is made from rattan and stained in an ash brown color to mimic natural wood and has removable seat cushions and a variety of accent pillows. The coffee table is a unique one, with solid wood top and supports and 4 stools tucked underneath it made from reclaimed wood. 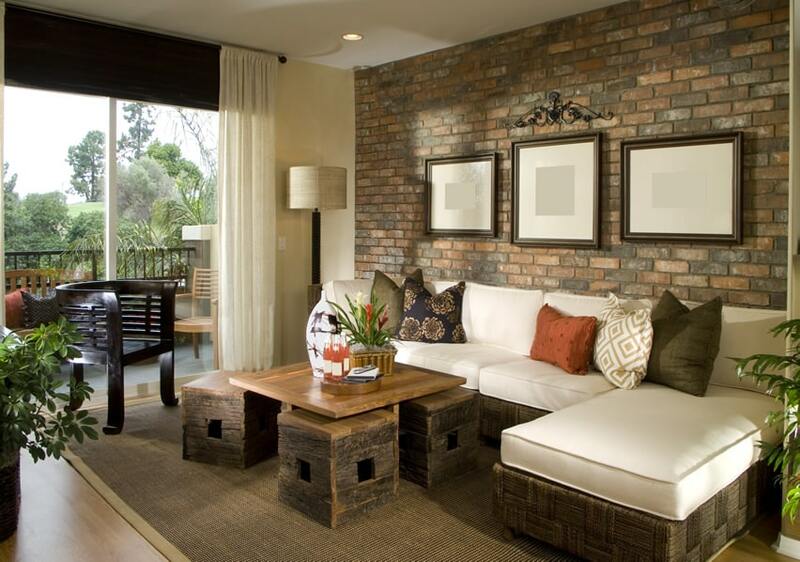 The faux brick finish behind the sofa adds to the effect. This living room design gives off a warm and comfortable vibe. The two large sofas look posh and extravagant, heavily upholstered by gray velvet fabric. The walls are painted with a marble finish, while the fireplace area is painted in plain white finish. 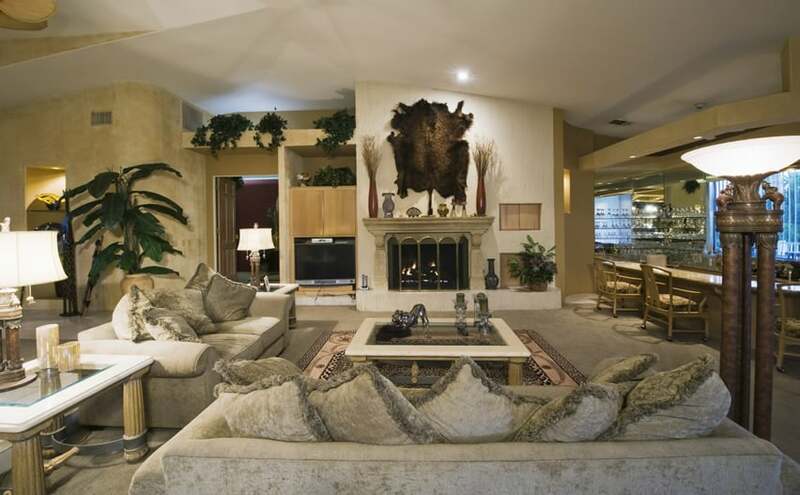 Above the fireplace, an animal skin rug is hung to serve as artwork while a variety of plants is used throughout the space to give it a more natural feel. A long home bar sits to the side of the room featuring a wheat granite counter top. This simple living room vignette is simple and classy. Walls and floors are all in white, while the French windows are framed with beige curtains. The sofa is a classic fully upholstered sofa in white with a matching white tufted ottoman and a gray shag rug. 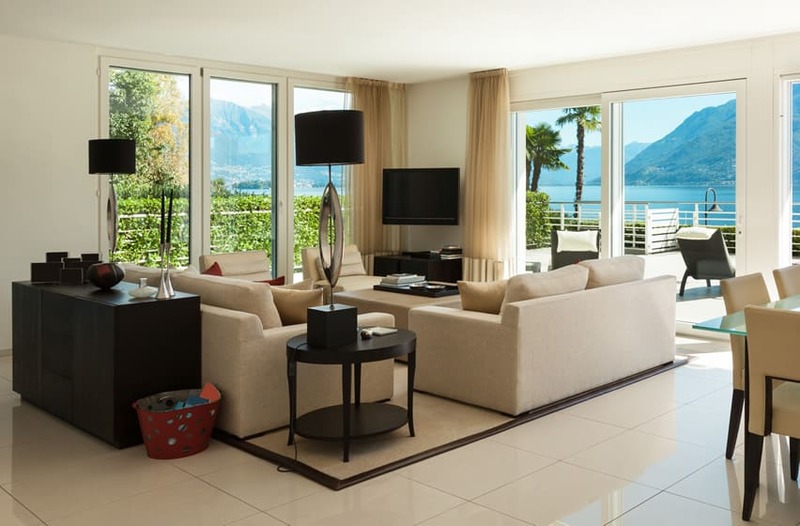 The sofa has a variety of pillows in different size spread across, and mirror finish side table and pedestal vases are also there to add accent to the room. This small living room space has obvious art deco influence most evident in its ceiling and furniture choice. 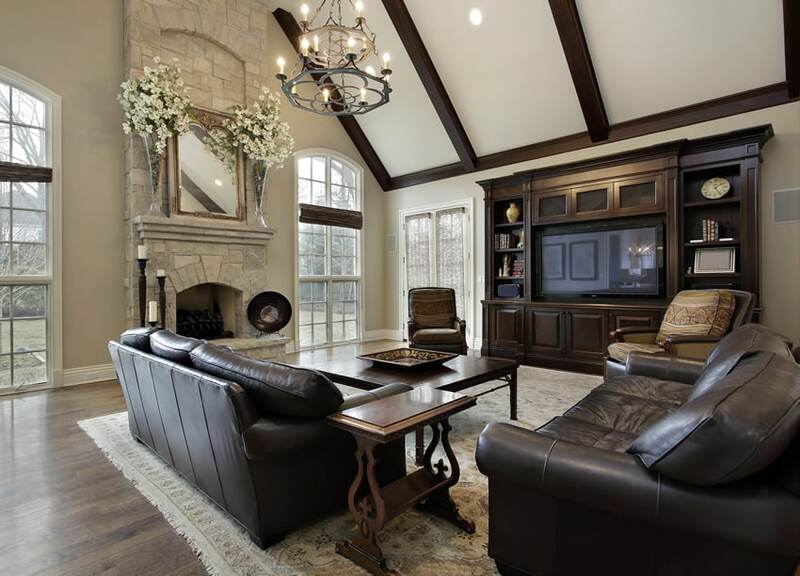 The TV wall is flanked by 3-level faux pillars in a rough stone finish, while the main walls keeps its masonry stone finish, adding a bit of grunge/texture to the space. Instead of sofas, it uses 4 armchairs, 2 side tables and one solid wood coffee table fashioned out from a large tree, maintaining its natural edges to keep its organic look. The TV is framed with wood, making it look part of the wall, and adding to the modern appeal of the space. A well-coordinated living room with classic design elements with a very elegant look and feel. The large carpet of the floors are coordinated with the color of the walls as both is a combination of white and yellow gold. For the furnishings, it has one large sofa with dark mocha velvet upholstery and 2 wing chairs in beige velvet upholstery. It also has a wengue-stained x-leg coffee table with gold details which perfectly matches the colors used throughout the space. This living room is best described to be simple and cozy, with a fairly large space to play around with. Walls are painted in a light and pleasing shade of yellow, with pine wood floors and a light beige traditional area rug, while the furniture pieces are only limited to a large brown leather sofa and a matching armchair, one accent armchair, a nesting table, 2 round side tables and a media cabinet in which the TV is attached. There is also a fireplace with natural stone finish, adding texture to the space, and various plants to give it more color. A good contrast of dark and light colors can result in a simple yet sophisticated look in any design. With the right combination of colors, finishes and textures, this bedroom design achieves just that. For this example, the basic finishes are mostly in light colors, including the stones used for the fireplace, while the movable pieces and some architectural details like the ceiling trusses are in a dark brown finish. Following the same formula, the living room uses a light colored traditional rug with 2 large sofas upholstered in dark brown leather, with two wooden armchairs, a large wooden coffee table and side table, and one large media cabinet in dark mahogany. This living room may be small but it does not fail to exude class and sophistication with its choice of furniture and finishes, mostly sticking to classic and elegant pieces typical of period styles. 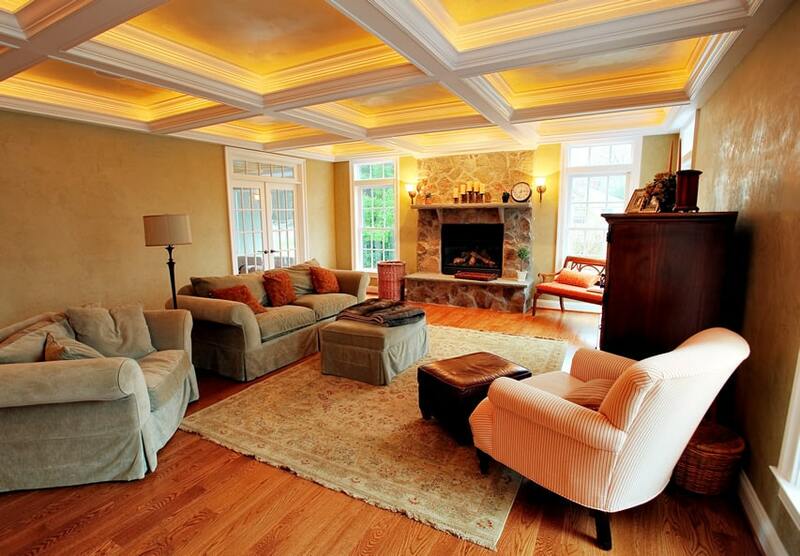 Walls are of gorgeous off-white color which matches the finish of the coffer ceiling. The small crystal chandelier adds to the elegance of the space, perfectly complementing the heavily tufted leather sofa. Other furniture pieces like the grandfather’s clock, the cabinet, coffee table and media console are finished in dark mahogany, giving a more classic antique appeal. This living room has a very simple styling, with only a few essential pieces and accessories. 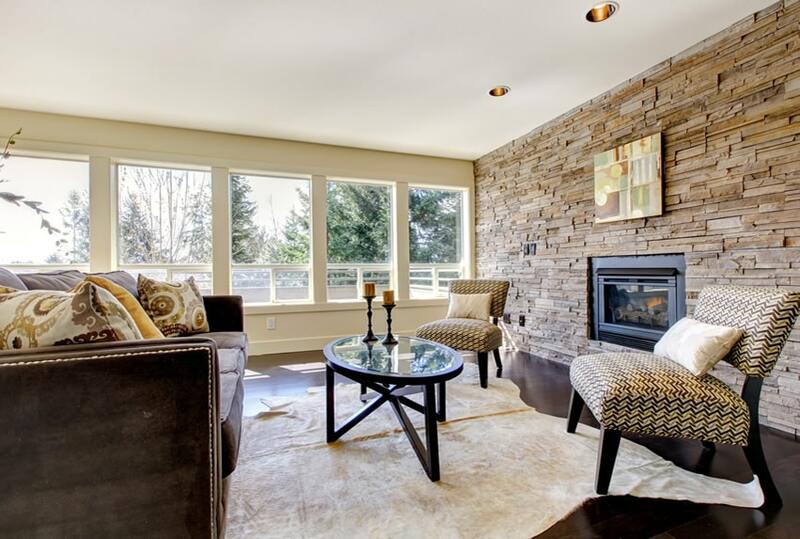 There is one accent wall with natural stone finish and a built-in electric fireplace. The floors are dark mahogany and has faux animal skin area rug in a light beige color. The furniture pieces are limited to one sofa with dark brown velvet upholstery, two sides chairs with printed upholstery and one small round coffee table with candle holders. Another classic living room design with a warm homey glow mostly credited to its use of a gold toned paint for its walls. The floors are warm carpet in an oatmeal color to tone down the yellows. There is one large sofa with a printed upholstery in gold/brown color, a baby grand piano, a fireplace, wooden side table and an accent fauteuil complete the classic look. This living room is directly connected to a small breakfast nook, but sets itself apart fro the other area with a different wall treatment. 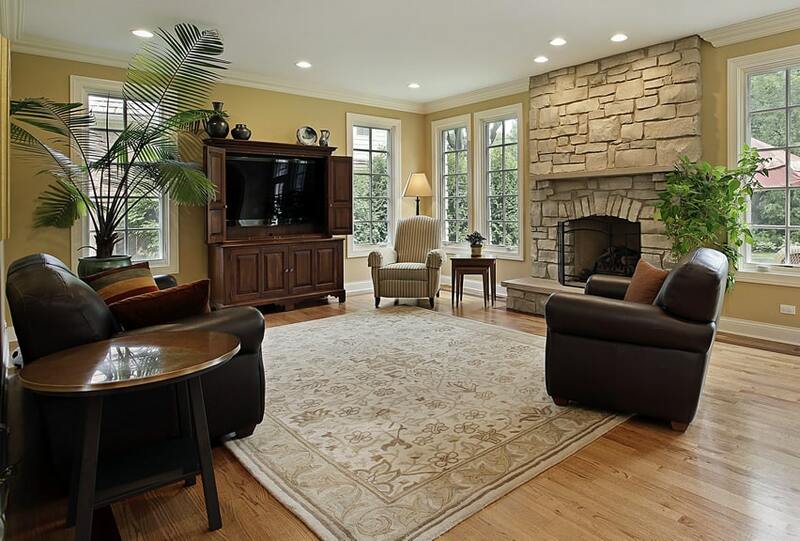 The walls of the living area are finished with natural unpolished stones in a gray tone, while the floors are all carpeted with a light beige color. For the furniture, it has a large brown lead l-shape sofa, a large solid wood coffee table with turned legs, 2 accent armchairs with upholstery matching the pillows of the sofa and one ottoman to match. 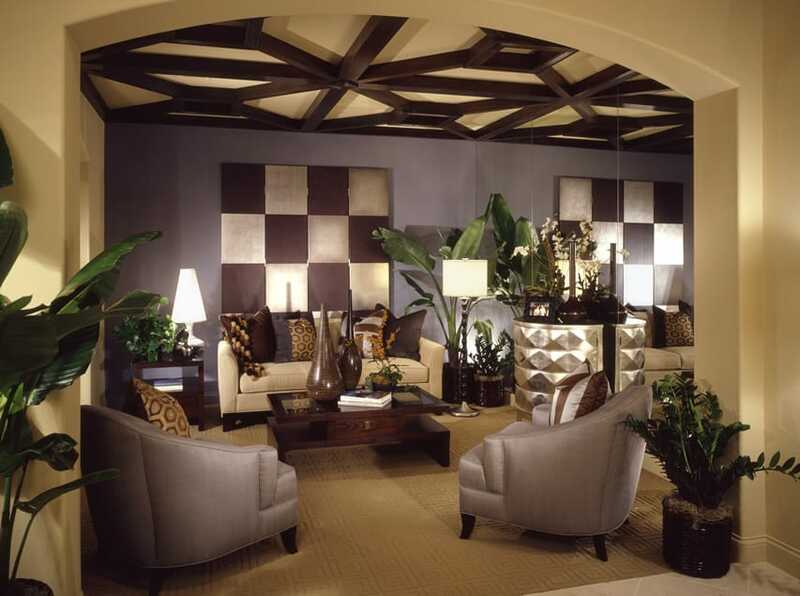 Living room decorating ideas can be combined to create a combination of different styles. This room is well-coordinated and well put-together despite the variety of interior design styles present. The space is divided into two sections: the main living area and a small private nook. The main living area has ebony wood floors and light yellow walls with dram-catcher inspired wall art. The furniture pieces is one white sofa and a yellow sofa with a metal and glass coffee table. The private nook has curtains for privacy if needed, is surrounded by wooden display shelves, and has two armchairs and an ottoman.